Take a stern look at your opponent. Shore yourself for battle. Torpedo their hopes for victory. Expect these and other ship puns to be deployed frequently in the playing of World of Warships. That or some 12-year-old will say a mean thing about your mother. A new trailer for Wargaming's ship-shaped free-to-play shooter shows off some in-game footage of the game being played. In it, big boats fire at other big boats with big weapons. Sometimes a big explosion happens. 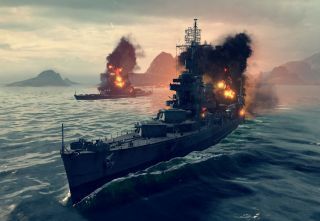 WoWS's beta testing phase is due to begin early this year.